We have been following stories of how European courts have been hammering Internet companies in stripping posters of anonymity and limiting speech (here and here). Now, Google has been hit again with a major fine of $1.4 million for failing to have cars that are readily identifiable in its Street View program in Italy. Italians complained that they were not given sufficient notice to get out of the way to avoid being filmed. Google has faced earlier small fines for the unauthorized collection of data and emails in the United States, Switzerland, and Germany. Obviously, with an annual income of a reported $50 billion, this fine will not be significant and Google has already paid it. However, it raises an interesting question of why public images need to be protected in this way. The camera is capturing the same view as a person at the same location. It is not clear how much notice the company must give to such images. The concern is that we recently saw how Hungary has made photographing people in public without consent a crime. 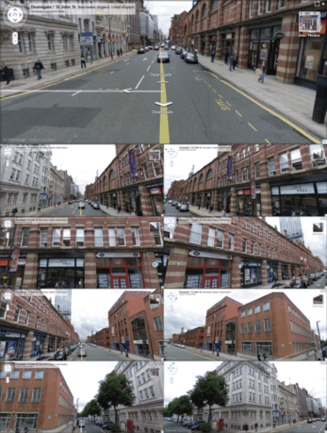 This ruling is clearly not saying that Google cannot film street views but the lingering question is whether there will be a growing European claim against being filmed in public. My concern is with the effort of governments to find ways to prevent citizens in this country and Europe from filming police in public and limiting other uses of photography. Ridiculous. Government theft with a rotten precident. What Chuck and Jon said. Maybe the Google cars should play a tune like an ice cream truck. Just on a side note if anybody is interested. Google is mounting cameras on these tricycle like things and getting into some really tight spots. Check out the old parts of Dubrovnik for instance. It’s really cool. They have even made it to within a few hundred feet of the Russia and North Korea border on a dirt road. My kids were captured on street view playing in the driveway of our home. I thought that was cool and immediately told them about it. They liked it too. Kind of made them a celebrity. They had no idea. I think the public streets are in the open area…and agree with raff that this has other implications than just government….. I think you should be able to film cops as well…. A friend’s dog made the street view. My 2 dogs were always in the yard but didn’t make the cut. For 5 years my house was a dirt lot, then the house appeared like magic. Two years later the house had a car in the driveway. I am not sure if Street View has been by, at this pace it should be sometime after 2015. I have been on the Google street view several times. Volkswagen painted with vomit green stripes and a five foot camera pole on top is only less conspicuous than a circus wagon. chuck your repeated appearances on street view is interesting. I have never even seen a car from the company but I am an academic hermit. I expect I would recognize one however by the paint job and bizarre camera apparatus. Now that I learned of your experience I will be looking for one. I have to drive a kid to fencing so I better comb my hair. restrictions on filming, even if you are a cop. Rafflaw, I tend to agree but what I find particularly curious is that the images that I have seen from this site do not zero in on individuals who are shown in passing. I am not sure why being shown on a passing camera is such an invasion for an individual and how we determine the level of notice achieved from a car paint job to protect wary citizens. Rupert’s Rag. No thanks. Too much like the NSA. Dredd – I read all the articles you, Annie and Elaine post. It is only fair your read mine. Dredd – just for you. Dredd, Bingo, you win the canned ham! Surveillance was my business. If you are in public there is no reasonable expectation of privacy. We are all videotaped CONSTANTLY. There are public and private surveillance cameras EVERYWHERE. Most folks have no idea. The genie is out of the bottle and she ain’t going back in. It is dictatorships that control what can be photographed, one or the other folks, there isn’t any comfortable middle. Keep the public spaces public, and the private ones private. And keep government in the appropriate government spaces. I think if you are in public, fair game to be photographed. These fines are wrong. Does sufficient notice of filming also apply to the thousands of government owned camera? The Italians clearly need the money and their justice system is corrupt anyway. Big corporations are deep pockets for governments who need a little extra cash. I see Google filming private citizens for what will then become a commercial, publicly available internet upload as being very different than filming public servants while on the job and in public employ. Particularly when those public servants may be exceeding their authority and infringing on the rights of private citizens. I am OK with limiting photographers’ ability to photograph people in public. But, It has to apply equally to governments. I have not seen much enthusiasm by government workers to limit their power.